Hortus Camdenensis | Abies procera Rehd. Fully-hardy, evergreen conical tree, becoming broad and columnar, with whorled branches when young, silvery bark, 2-ranked, bluish leaves, to 3.5cm long, and cylindrical green and brown cones, to 25cm long, on the upper branches. To 45m. [RHSE, Hortus, Hilliers']. Introduced to Britain in 1831 [JD] by David Douglas [Hilliers']. Leaves, cones and seeds of Pinus nobilis are illustrated in Die Coniferen. [Die Coniferen t.XXIX/1840-41]. Listed only in the 1857 catalogue [C.50/1857]. Abies procera Rehd. 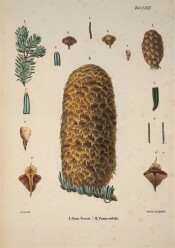 | Die Coniferen t.XXIX/1840-41 | BHL. Pinus nobilis is Fig.ii in the centre. Abies nobilis (Douglas ex Lamb.) Lindl. Pinus nobilis Douglas ex Lamb.